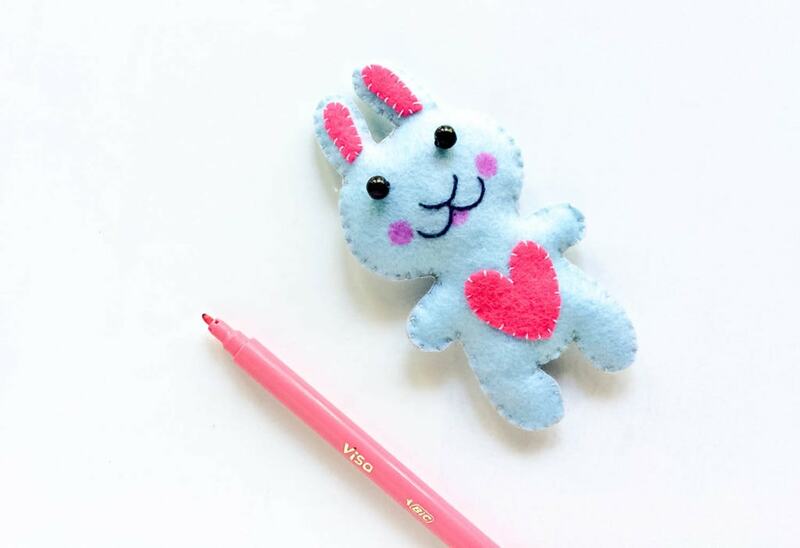 A fun Easter treat to make for the kids (or adults!) that is quick and easy to prepare. 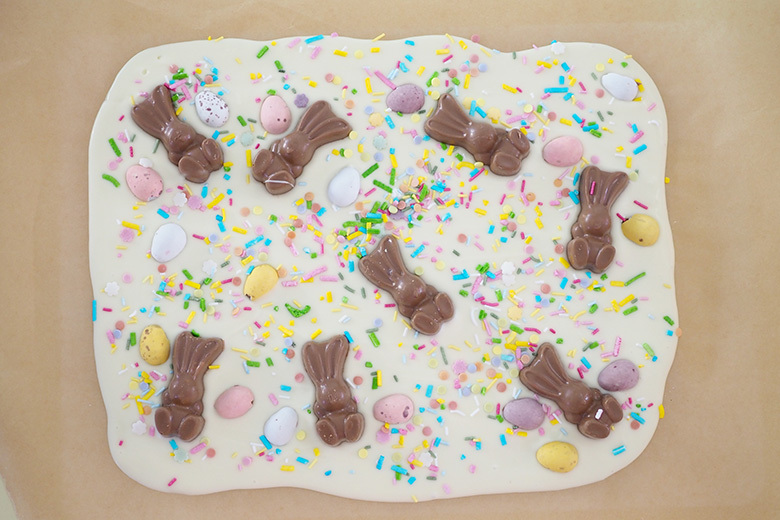 Only have 20 minutes to spare and want to create something delicious for an Easter gathering? 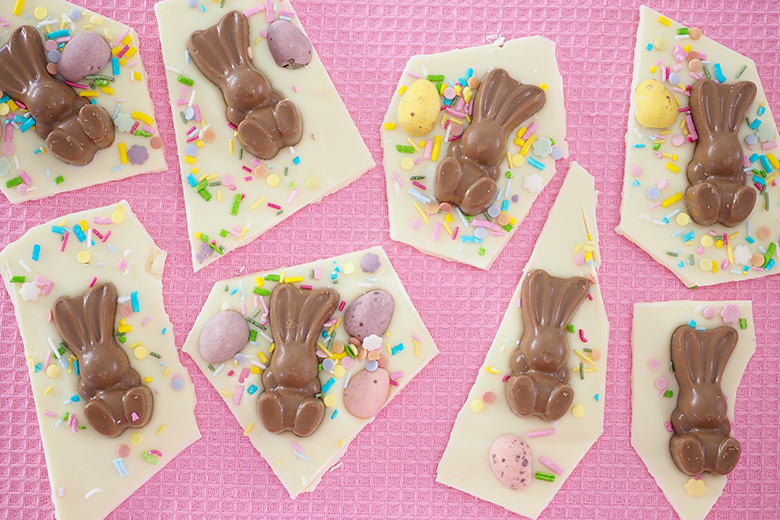 I’ve got you covered with these yummy and quick to make Easter Bunny Bark treats. You can honestly whip them up in under 20 minutes, and they add a colourful touch to the more traditional Easter nibbles. I said they were quick to create, and I wasn’t joking… you do actually need to work fast when creating these cuties as the chocolate base sets very quickly. When setting, you can leave longer in the fridge if you like, but I found mine set within 10 minutes. 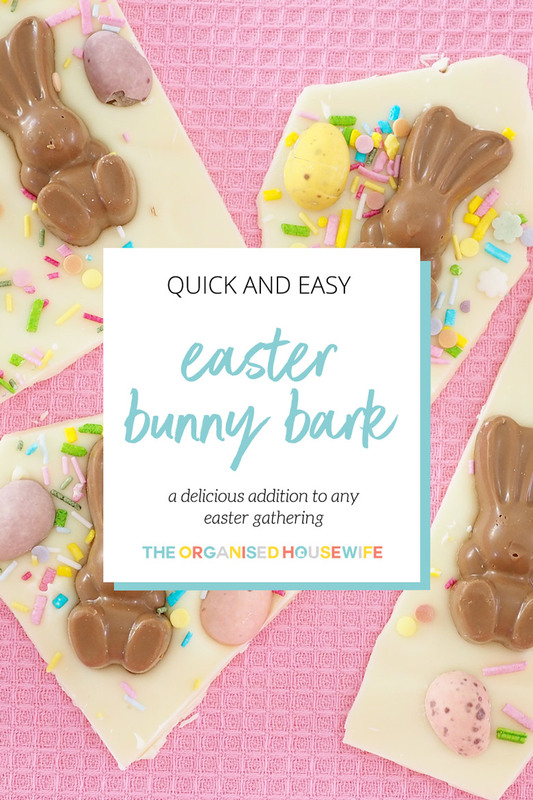 Whilst they’re quick to make, it’s worth taking a little more time to cut them up with a knife, as I found trying to break them with my hands caused them to break along the bunny (and nobody wants a broken bunny at Easter!). My kids loved these so much – and so did the girls in the office! Perhaps I’ll make a double batch next time. Follow packet directions to melt white chocolate. Pour chocolate over baking paper and smooth out into a 30x20cm rectangle. Working quickly as the chocolate should begin to set soon, drop mini bunnies onto white chocolate spaced evenly apart. Place chocolate eggs, sliced side down next to bunnies. Place in fridge for 10-20 minutes. For kids wanting to give these as Easter gifts at school, they are a great alternative to traditional Easter eggs. 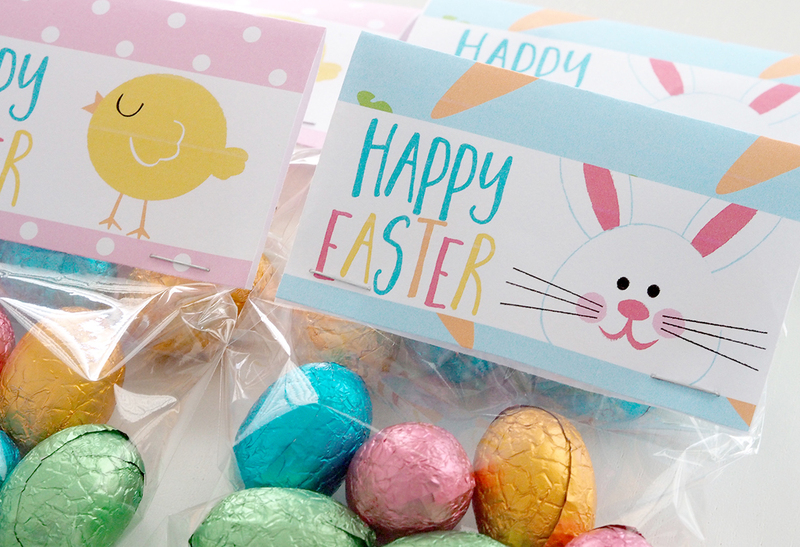 Simply pop one or two in a small cello bag and finish off with an Easter Bag Topper – presto! LET ME KNOW WHAT YOU THINK OF THIS RECIPE! 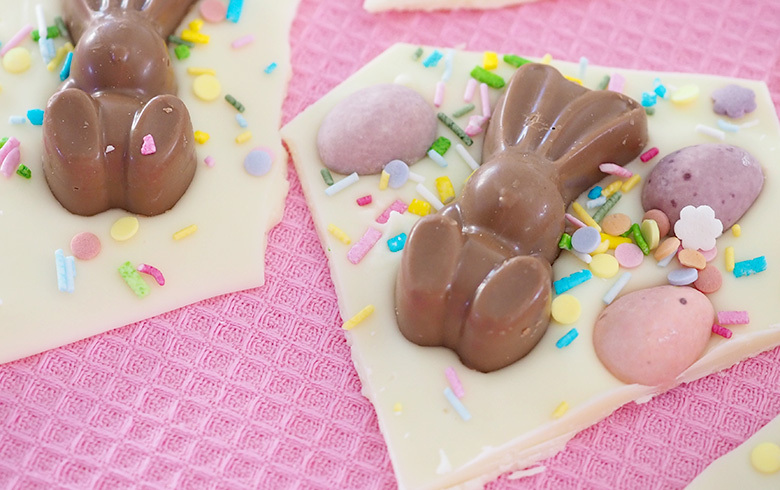 – If you’ve tried this Easter Bunny Bark recipe, please leave me a comment below. I love to hear from people who’ve made my recipes! You can SUBSCRIBE to receive my newsletters with the latest recipes, or FOLLOW ME on FACEBOOK, INSTAGRAM and PINTEREST for even more delicious food. ARE YOU ON INSTAGRAM? – If you make any of these recipes, please share a photo, tag @theorganisedhousewife and add hashtag it #TOHRecipes – I’d love to see what you’re cooking! HOW DO YOU MAKE YOUR EASTER SPECIAL? I love this! How do you manage to cut the mini eggs in half without slicing a finger? use a good knife and cut along the seam! This is great! This idea will be more fun for my 5yr old & I to make for our cousins Easter gifts. Just wondering where you get those confetti pieces from?